Earlier this week I listened to an interview on Focus on the Family. The guest told of her husband suddenly becoming ill and passing away within 24 hours. She not only became a 31-year-old widow, but she also became a single mom with two preschool boys. She spoke about how God had prepared her in advance for her loss and the subsequent challenges. Months earlier, she’d read Psalm 121 and written it down for quick and easy recall. It begins, “I look up to the mountains—does my help come from there? My help comes from the LORD, who made heaven and earth.” She’d found the phrase “My help comes from the LORD” especially meaningful. Within moments of her husband’s passing, this phrase came to mind and brought hope and confidence that, despite her world doing a flip, everything would be okay. The Lord—almighty Maker of heaven and earth—was with her and would be her strength and wisdom moment by moment. He’d promised to be her helper, and He fulfilled His word. I’ve experienced the Lord’s help on many occasions. Currently, He’s helping me write my next book. Every day, when I sit down at my computer, I ask Him to give me the words that He wants penned for that day’s portion of the manuscript. I’m leaning heavily on Him, and He’s proving faithful. In the past, He helped me through the challenges of culture shock and isolation when I moved to Nepal as a newlywed in 1982. He gave me energy when I was a young mom raising three preschoolers. He helped our family transition into career camping ministry in 1996. He helped me grieve the loss of my father and my husband’s parents within 16 months. On an ongoing basis, He helps me and Gene by providing financial support through faithful donors to our ministry month after month. He helps me make wise food choices and rise early to exercise at the gym every morning. He helps me stay healthy despite traveling so much, eating foods foreign to me and sleeping in beds that aren’t like mine. This list could go on and on. Why? Because God’s faithfulness never ends. No problem we face is too big for Him. Nothing we encounter surprises Him. No need we experience drains His resources. There’s no way on earth I could navigate life and its challenges on my own. I give all the credit for every successful endeavor past, present, and future to my Helper. 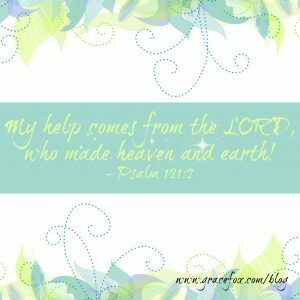 Our help comes from the Lord who made heaven and earth. He stands ready and waiting, eager to lend a hand the moment we invite His participation in our circumstances. How have you seen this prove true in your life? I’ll host a FB Live chat about this blog/verse on Saturday at 1 PM PST. Join me if you can, okay? Share how God is your helper and encourage others who join the chat.